On July 23rd, I began a new job. My job responsibilities are quite similar—I still read lots of mammograms, x-rays and CT scans and perform many breast biopsies—but my new job is different in one important way. Instead of a twenty minute commute, my drive is now over an hour each way. I could choose to bemoan this fact and complain about the time wasted sitting on my tush, but instead I am choosing to claim the time for myself. On one or two legs of my weekly commute, I listen to NPR to stay current on the news (more than that makes me queasy), and the rest of the time I listen to audiobooks. I've begun working my way through my library's audiobook collection, but at the pace I'm going, an Audible membership is definitely in my future. Only three weeks into the job, I've already finished two audiobooks. This quirky book was my first choice and it was a great one. This character study was written by Sayaka Murata and was a major bestseller in Japan, selling more than 600,000 copies. The translation by Ginney Tapley Takemori is exquisite and the audio performance by Nancy Wu is spare and cool, perfectly matches the writing style. Murata tells the story of Keiko, a Japanese woman in her mid-thirties who has always been a bit odd. She has no real friends and has always had trouble swimming in the mainstream. When she was eighteen, she took a job at a conbini—a Japanese convenience store that is more like a cross between a small grocery store and a fast food restaurant—and she never left. She is proud of herself for becoming a cog in the machine and doesn't aspire to anything more. Despite her family's disapproval of her life choices, she feels comfortable there and can't imagine leaving. When Shiraha, an obnoxious young man, starts working at the conbini, Keiko begins to doubt herself and must decide how to she wants to live the rest of her life. This is definitely not a page-turner. There are no major plot twists, and in fact not much plot at all, but the exploration of Keiko's personality is so well done that I was riveted. I really wanted to figure out what made Keiko tick and I rooted for her to take a stand for herself. The author and/or translator, (I never know which one to give more credit to with a translated work), have an incredible way with language. I found myself wanting to stop the audiobook and rewind, but I couldn't because I was driving. Fans of Eleanor Oliphant is Completely Fine and Olive Kitteridge will adore this book. And clocking in at only three hours, it gave me a sense that this audiobook thing was a great idea and the momentum to keep going. 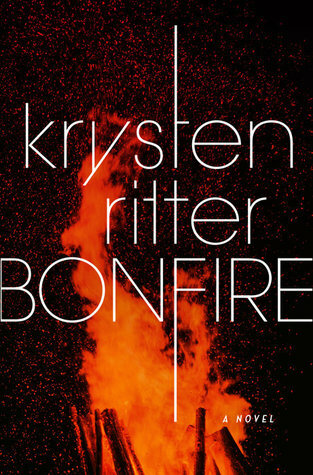 My next choice was Bonfire by the actress Krysten Ritter, narrated by Karissa Vacker. I was a big fan of Ritter's work on Breaking Bad, and the description sounded intriguing. If I were to pitch this book, I would describe it as Erin Brockovitch meets Gillian Flynn's Sharp Objects. Young woman with a dark past flees her small town for the anonymity of the big city. When her job forces her to go home, she must face the demons of her past in order to solve the current day mystery. In this case, Abby Williams is an environmental lawyer in Chicago who comes home to Barrens, Indiana to investigate the waste disposal practices of Optimal Plastics, the biggest employer in town. People are getting sick and Abby thinks Optimal is to blame. Throw in two love interests, a former popular girl bully who is now the school principal, an ornery father with memory issues, and the story takes off. This novel didn't break any new ground, but the writing was solid and it kept me listening. It was a good second choice. I'm taking a week long vacation and then I'll need to decide what comes next when I start the commute again.